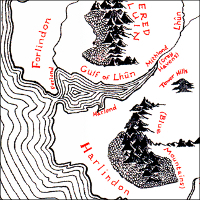 Location: The principal and easternmost of the three harbours — Forlond, Harlond, and Mithlond — built by the Elves on the Gulf of Lhûn in Lindon during the Second Age; the realm of Círdan the Shipwright. The Lindon region, including Mithlond, the Grey Havens. [The] Tower Hills... look [west] towards Mithlond in the Gulf of Lune where the grey ships lie. At the Grey Havens dwelt Círdan the Shipwright, and some say he dwells there still, until the Last Ship sets sail into the West. In the days of the Kings most of the High Elves that still lingered in Middle-earth dwelt with Círdan or in the seaward lands of Lindon. [The] Keepers of the Three Rings rode to the Sea, and Master Elrond took there the ship that Círdan had made ready. And when they had passed from the Shire, going about the south skirts of the White Downs, they came to the Far Downs, and to the Towers, and looked on the distant Sea; and so they rode down at last to Mithlond, to the Grey Havens in the long firth of Lune. mith 'grey' in Mithlond, Mithrandir, Mithrim; also in Mitheithel, the river Hoarwell in Eriador. 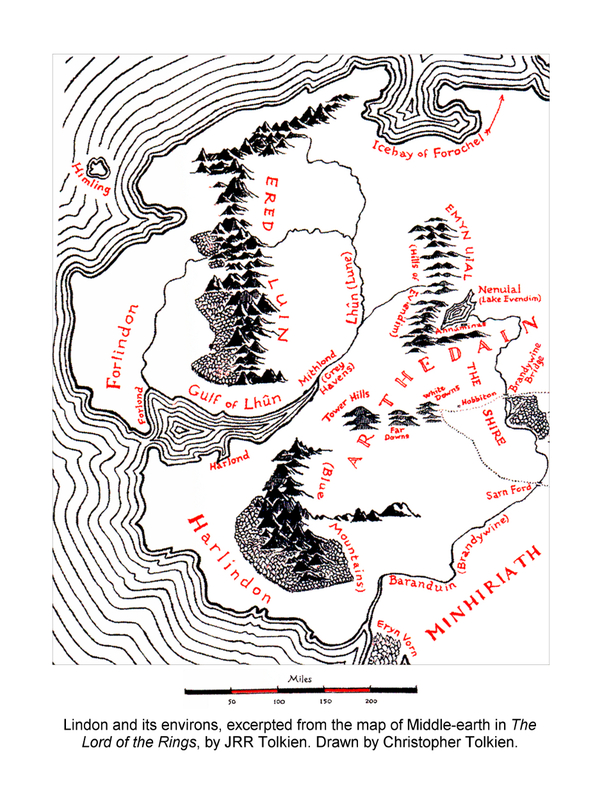 londë 'land-locked haven' in Alqualondë; the Sindarin form lond (lonn) in Mithlond. 1 The 'immortals' who were permitted to leave Middle-earth... set sail in ships specially made and hallowed for this voyage, and steered due West.... They only set out after sundown; but if any keen-eyed observer from that shore had watched one of these ships he might have seen that it never became hull-down but dwindled only by distance until it vanished in the twilight: it followed the straight road to the true West and not the bent road of the earth's surface.